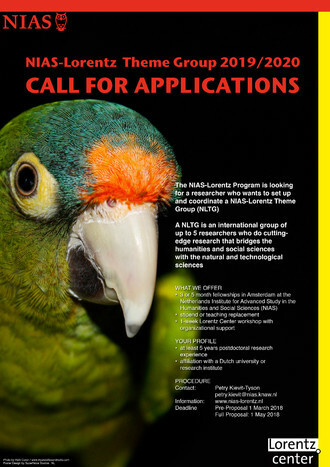 The NIAS-Lorentz Program calls for coordinators for the NIAS-Lorentz Theme Group (NLTG) 2019/2020. The deadline for application with a pre-proposal is 1 March 2018. The NIAS-Lorentz Program is a collaboration established in 2006 by NIAS (Netherlands Institute for Advanced Study in the Humanities and Social Sciences, Amsterdam) and the Lorentz Center (workshop center for all scientific disciplines, Leiden). The NIAS-Lorentz Program promotes innovative interdisciplinary research that brings together perspectives from the social sciences and humanities on the one hand and the natural and technological sciences on the other. This program gives special attention to topics of societal importance that require extensive collaboration across traditional scientific boundaries in order to progress. A NLTG can particularly benefit early/mid-career researchers who wish to explore and open a new interdisciplinary scientific field. Information about the NLTG call as well as the partners of the NIAS-Lorentz Program can be found at the NIAS-Lorentz website.